People attend a Candlelit vigil at St Stephens Green in Dublin to mark one year since the death of Savita Halappanavar. A woman attends a Candlelit vigil at St Stephens Green in Dublin to mark one year since the death of Savita Halappanavar. A man attend a candlelit vigil at St Stephens Green in Dublin to mark one year since the death of Savita Halappanavar. 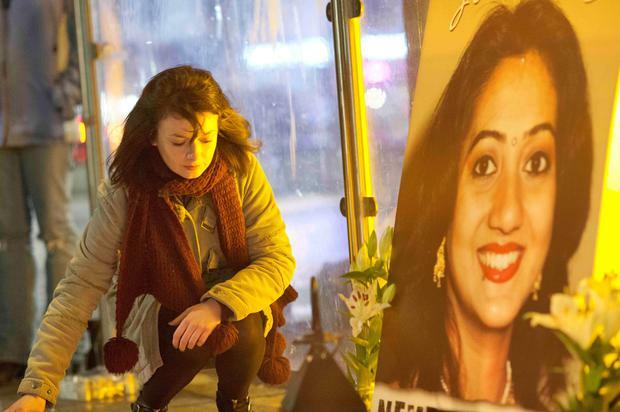 HUNDREDS of people around the country took part in candle-lit vigils this evening to mark the first anniversary of the death of Savita Halappanavar. Friends of the young dentist gathered in Galway, Dublin and Cork alongside those who had never known her but whose story had touched their hearts. In Galway, they lit candles in front of a single picture of Savita with the words 'For Savita, Never Again'. Standing in silence, the crowd listened while a lone singer gave a rendition of Nancy Spain, ending it simply; 'Savita we will never forget your name'. Savita had made her life in Galway with her husband Praveen and was looking forward to starting a family there. Close friend Sunil Koppuri lit a candle at the vigil this evening. He was joined by a number of families from the Indian community who all recalled their friend a year after her death. In her hometown of Belguam, India, Savita's parents and brothers gathered with family to remember her. Her father Andaneepa said he and his family were touched by the memorials being held in Galway, Dublin and Cork to remember their daughter. The 31-year-old dentist died at Galway University Hospital on October 28 of last year. She was 17 weeks’ pregnant and miscarrying when she was admitted to University Hospital Galway on October 21. She died as a result of of septicaemia caused by ecoli ESBL. A HIQA report into her death highlighted 13 missed opportunities in her care. Her widower Praveen will meet with Health Minister James Reilly in the coming weeks to discuss the reports and the forwarding of the reports onto the Medical Council and the Irish Nursing and Midwifery Board. Robin Schiller Gardai are investigating the theft of two ATMs with a digger in Co Meath overnight in what is the 16th such incident so far this year. Leona O'Neill and David Young Shots were fired during disorder in Derry last night, just hours after the third most powerful politician in the US had praised peace in the city.